Twisting his arm...............................Twisting his arm, more. A quick recount of my life with a Bean Bag (how sad). I must admit that the bag detailed in the link below is really a fairly recent and incredibly cheap addition to the Kerrowdown arsenal, it only arrived on the scene when "HM The Queen" (SMC Pentax 500mm F4.5) moved her Winter residence to Castle Kerrowdown. Now that I have it, I find the other Ladies within the harem have also become quite attached to it, namely “Gorgeous Lady” (Pentax-A* 200mm F2.8 ED) and my “Duchess” (Pentax-A* 300mm F4.0). It provides rock solid support, while still remaining light to carry around and flexible enough to deal with any situation depending on how you use it. Even to the extent of unhanded support for lens/camera combos while waiting for the action to happen. As I have no lens longer than 200, this is my solution - very light, difficult to mislay, and best of all : 50p at Tiger ! But how comfortable is it as an emergency pillow when you need a nap in the field? Let's get to the important question. And does your wife get confused when you say you are living with a bean bag? It could be just an unkind reference to herself. I usually sleep on the way home not while I'm out - don't want to waste the daylight. And before you panic, I don't drive, I use public transport. To quote Riff-Raff (Rocky Horror Show) 'The Master is not married, nor do I think he ever will be' ! Please do not sit on these Bean bags as the polystyrene balls what are in this bag, will eventually go flatter after time, it is always best to top up the bean bag at some point with adding polystyrene balls to keep the bags shape. But how comfortable is it as an emergency pillow when you need a nap in the field? Not so good, it's a bit too firm for that sort of use. Nah, Lady Kerrowdown doesn't have any TRUE TIMBER HTC Pattern Camo Waterproof 500D Cordura outfits... so I'm safe. Rolled up pieces of foam cushion material (in various suitable firmness) tucked into the cut off tops of orphaned socks works for me. Cheap, expendable and offers some utility for 'widowed' socks too. 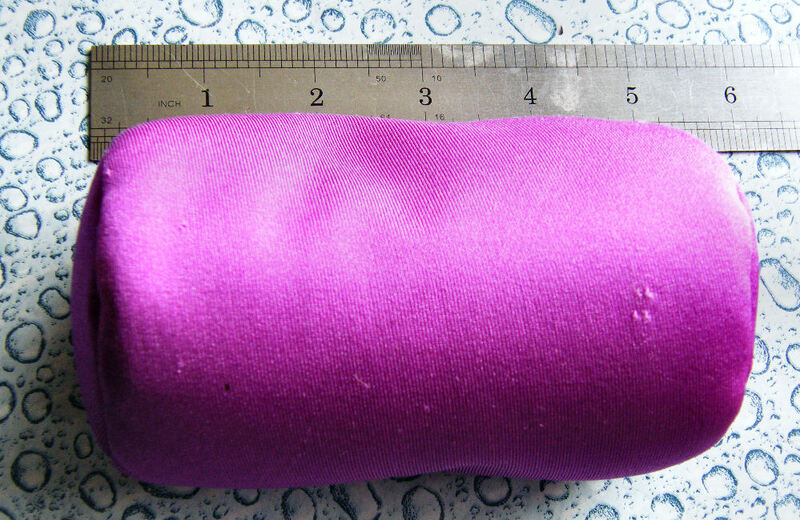 'Un-stuffed' sock tops also make nice, protective lens sleeves in the kit bag. I use Stealth Gear beanbag filled with cherry stones inside. Less plastic and still lightweight. I'd have a bad case of diarrhoea... getting enough cherry stones to fill mine.